A chubby city girl visits her grandparents’ farm where she tries to find a friend and overcome her fear of horses. 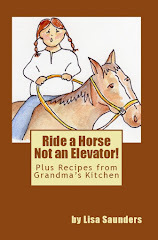 Ride a Horse Not an Elevator is a test of young courage. Lisa is a chubby city girl searching for friendship and excitement. She leaves home, and the elevators and bullies of a big apartment complex, to spend a summer in the country at her grandparents’ farm. Culture shock! Accompanied only by her loyal beagle, Donald Dog, Lisa faces a summer in a very different environment with its own challenges and dangers. Using an outhouse is the least of her problems! She is terrified of her new pony. Lisa’s grandfather is injured by a charging cow and needs her to ride the pony to get help. Remembering Grandma’s lesson about how love overcomes fear, she pushes herself past her anxieties to ride alone and obtain the help he needs. Also includes recipes from grandma’s kitchen. My mother sighed and then smiled as if she knew something Uncle Jim didn't. "Okay, but you'll be sorry!" With that, Uncle Jim and I drove off. Donald Dog rode in the back with some clothes and packages, and hung his head out the window. As we picked up speed, his ears flew back and his lips quivered when he faced the wind. "Lisa, I don't know this area so I'm going to need you to be quiet until I figure out how to get out of the city. O.K?" "Okay." I was glad to be quiet. That meant I could dig into the huge bag of gum balls Uncle Jim had bought me. I chewed one gum ball until the sugar coating was gone. I wanted to spit it out to chew on a fresh one. "May I eat another gum ball?" "Go ahead. But please, I really need you to be quiet so I can concentrate." "But, Uncle Jim, what do I do with my old gum ball?" "Spit it out the window. I just can't worry about it now," Uncle Jim snapped. Spit it out the window? That sounded like fun! My parents would never have let me do that! I carefully aimed my lips toward the window and spit my gum through it. The wind quickly grabbed it and flung it backwards. I chewed another gum ball. As soon as it lost its coating, I again spit it towards the window. I repeated this several times. I was keeping busy, just like Uncle Jim hoped I would. Once Uncle Jim and I were on the open road driving away from the city, he relaxed. I had almost chewed through all my gum. "Uncle Jim, I have to go the bathroom." "Well, you'll have to wait until I find a sign for a rest room." "But Uncle Jim, I have to go really bad--now...I can't wait!" "All right. I'll take one of these exits. Maybe we'll find a gas station or something." I could barely stand the ride, I was so uncomfortable. When I turned around to check on Donald Dog, I was horrified. Donald's head was happily hanging out the window, but stuck all over him and the back seat were chewed up wads of gum! The gum I had spit out had been swept right back into the open window behind me. It was all over the seats and Uncle Jim's clothes. Donald Dog had been stepping on it and grinding it in. What was Uncle Jim going to say about this!